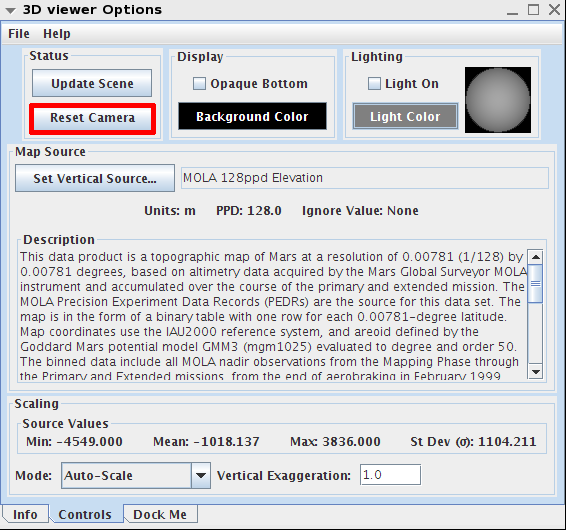 The 3D Layer is unlike many of the JMARS layers because it does not load any visual data into the Viewing Window. Instead, it opens a new window and displays a three-dimensional version of the scene in the Main View. 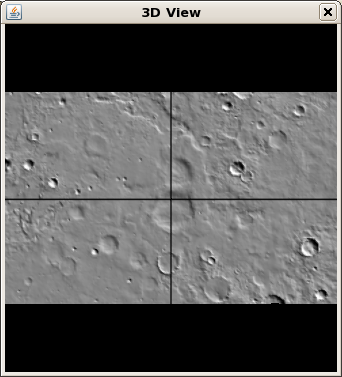 This allows the user to observe the altitude of the terrain directly, instead of relying on the shadowing of the 2D maps to determine the height or depth of certain features. 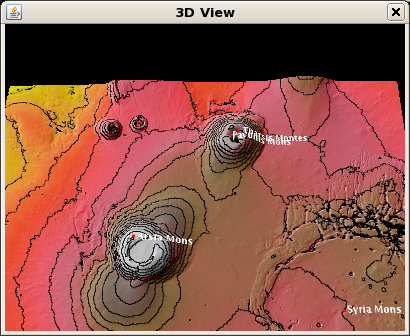 The 3D Layer is available in the THEMIS and Public releases of JMARS. 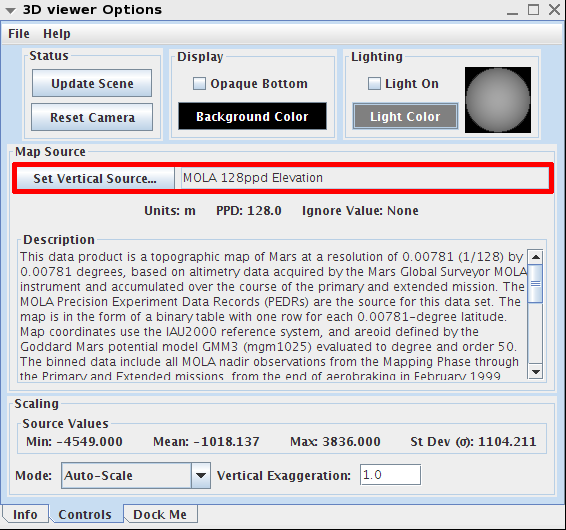 Display a Map in the Viewing Window: Before loading the 3D Layer, the user must display a graphical map in the Viewing Window. 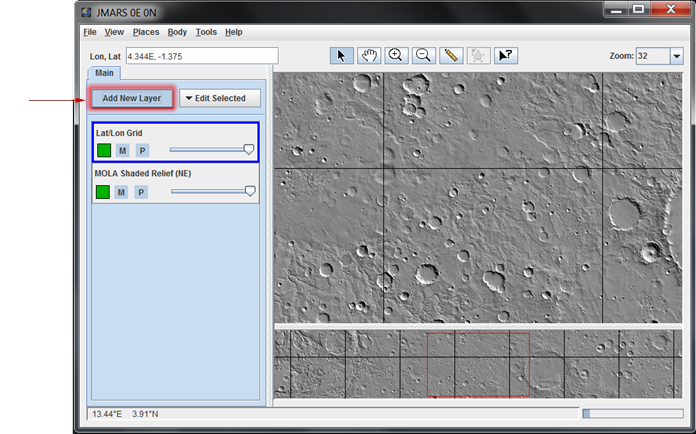 Users can also display the Lat/Lon Grid Layer, the Groundtrack Layer, the THEMIS Planning Layer or any other layer which draws visible data in the Viewing Window. 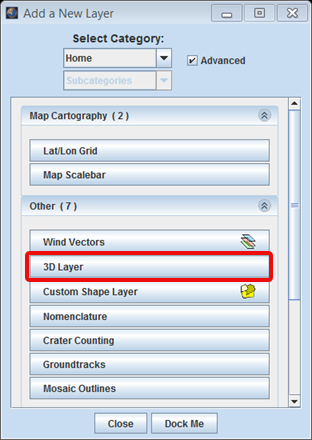 Open the 3D Layer: Chose "Add New Layer" -> "3D Layer"
Reset the 3D View: If the area displayed in the Main View is changed, the area in the 3D View will not automatically change. Clicking the "Reset Camera" button in the 3D Layer focus panel will refresh the 3D View to match the Main View. Select the map source: Click the "Set Vertical Source" button to to get an additional dialog window. You can select the map you would like to use as your source from the new dialog window. Try using the "Search" area to find your map faster. Once you have your 3D Layer window open with your map source and settings complete, you can export a 3D printer file. 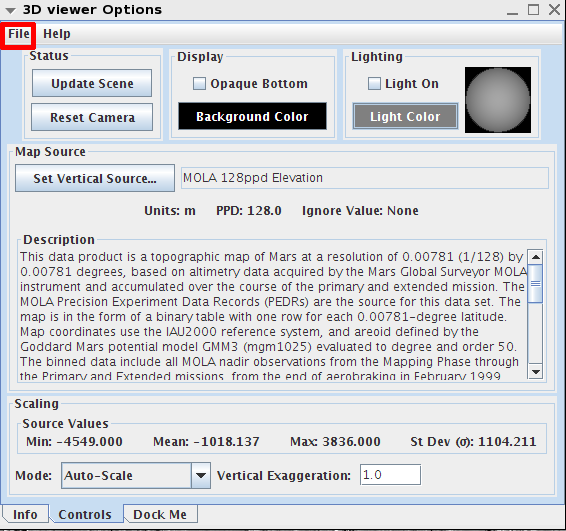 Press the "File" menu on the 3D viewer option. Then select "Save 3D Printer File"
Display the Focus Panel: At the top of the Layer Manager, click on the "3D Viewer" tab. Scene Properties: The scene properties control the appearance of the surface displayed in the 3D Window. Bottom: Selecting this option will apply a color to the bottom of the 3D surface in the 3D window. This makes it easier to make sure the user is viewing the top of the surface instead of the bottom. Update Scene: If the position of the Main View has changed, click this button to refresh the view displayed in the 3D window. Z Scale: This option allows the user to exaggerate the altitudes displayed in the 3D window, which is particularly useful when displaying relatively flat terrain. By default, the elevation (z-axis) has a scaling multiplier of 1.0. To change this value simply change the multiplier and click "Update Scene". Altitude: This option allows users to display altitude data from different sources. 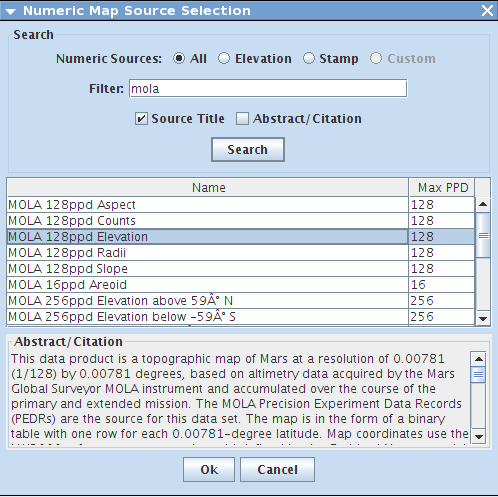 The default source is the MOLA altitude data. 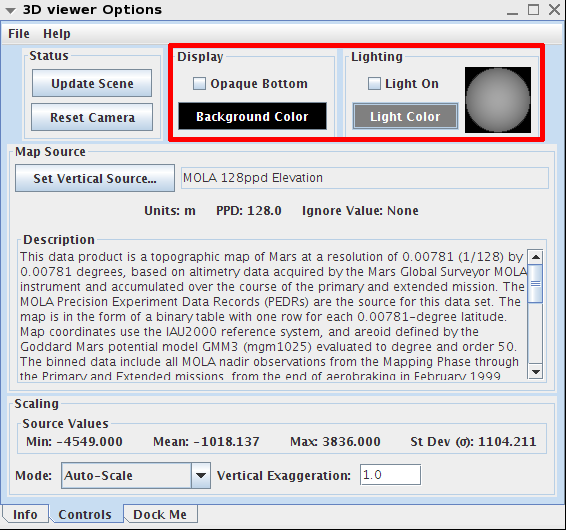 Orientation: This section of the focus panel allows the user to control and modify the view in the "3D View" Window. Directional Light: This section of the focus panel gives users the ability to add an artificial light source to the 3D window in order the change the appearance of shadows on the 3D terrain. Light On: This check-box will turn on the artificial light source. The default setting is off. Light Color: This button will give users a color palette from which they can choose the color of the light source. Light Source Position: The lighted circle represents the position of the artificial light source. 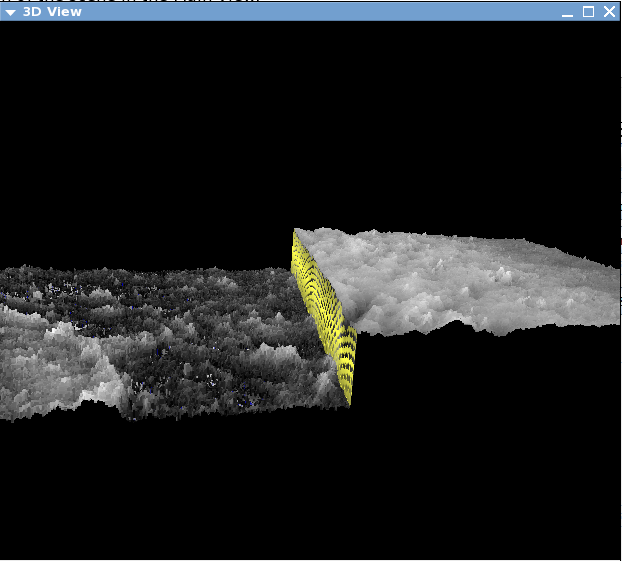 By default, the light source is positioned directly above the 3D terrain. To change this position, click on the center of the lighted circle and drag it around the box. Release the click to see what the terrain looks like with the light source in the new position. Under the "Scaling" section at the bottom of the window, you will find a pull down menu, "Mode"
Mode: After you load the 3D Layer, double click the Layer in the Layer Manager to see the 3D Viewer Options. Under the "Controls" tab you will see a new option, "Scaling Mode". There are 3 new options:. Standard Deviation: Uses the Standard Deviation of the dataset to draw the vertical scaling. If the dataset has a small Standard Deviation, the vertical stretch in the 3D Window will be very small. Best used with the Elevation or Numeric sources. Range Values: Uses the Max and Min values and excludes the ignore value of the dataset to draw the vertical scaling. Best used with Elevation and Numeric data. NOTE: When using stamps as your elevation source, Zoom in on your main screen to eliminate area that isn't covered by the elevation data. 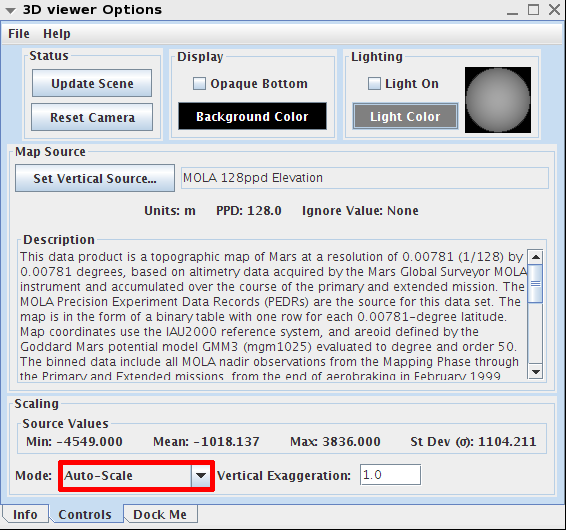 Elevation Data: If you are loading data with elevation information, try the Auto Scale option first. If this doesn't give you the results you are looking for, try the Range of Values option next. Example: A night time IR stamp and a day time IR THEMIS stamp are both loaded. The range of values differ, therefore, causing a gap in data (shown in yellow). Numeric Data: If you are loading/using Numeric Data use the Standard Deviation option first and then the Range of Values option if you don't get the results you want. The Auto Scaling option automatically scales using the radius of the selected planetary body, therefore, your results may hardly be noticed if you use this option with numeric data.